1. If it's just plain old fescue or some other cool-season turf (seed produced above ground), sheet mulch/compost away. If it's NOT, then it is imperative that the green layer be removed by scraping it off and disposing of it. With nut grass, the nuts WILL sprout back, but less and less as the top becomes more nutritious and the green continues to be removed over time. 3. Apply compost tea or a layer of compost 1" or so BEFORE the weed barrier (cardboard, painter's paper, etc) goes down. 4. Water the soil BEFORE putting down the paper -- you want it to get hot beneath the cover (so so speak). 5. 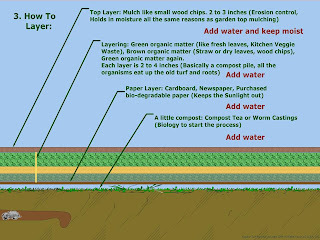 Layer 2" - 4" EACH dry leaves, straw, or other mulch material, then wet materials (compost). Then put dry material down to top it off. In the wet layer (compost), add a little garden soil to the mix as it's being put down -- this will stimulate any microbes asleep in the soil to wake up and smell the compost. -- and get to work. Think 5" - 8" of FINISHED layering as a minimum -- it's essentially a raised bed for planting. 7. Bake at 350 -- oh, that's the recipe for short bread, sorry -- plant. Water thoroughly on a regular basis while this stuff starts to cook. This recipe assumes you are planting vegetables in this raised bed area. (bacteria-based microbes go to work quickly and support grassy, weedy things like veggies) If you are planting perennials, shrubs, etc. , then the sheet compost should cook for a couple weeks before moving forward. (fungal-based guys go to work to support the woody plants). Most of the "literature" from gardeners says "go ahead and plant right away" since the veggies are SO bacterially based & they don't need the heavy nutrient stuff created by the breaking down of more celluose items like wood chips or mulch. If the compost is salty (which, BTW, I am completely assuming it will be, if it contains horse manure), then they may get tip-burning. Applications of compost tea may remedy this -- steady watering too."